My question is about floodings caused by heavy rain. Is it usual that these townships flood during the rain season? If yes, what is the usual height that the water level achieves? Is it acceptable to drain the water, using a slight inclination in the ground, off the courtyard to the exterior of the plot? - Can we define the measures of an hand pressed brick? If not, what are the options for standard measures? - Is it normal/necessary to have glass frames in the windows in this area? - Is it possible that I design my own doors and window shaders using local wood, instead of buying standard? - How much does a usual latrine cost (including all expenses)? - Is it cheaper to purchase the wood from the local forest, or to buy it from the wood market? - Is it possible to include mid size trees in the plot? If so, how much would it cost (a relativelly grown tree)? Thank you and I'm sorry if some of this questions were already answered. Just to add to the question. Is there a directory for sheet hardwoods and softwoods with standard sizes in Ghana as I need to work out the dimensions and costs of the formwork (rammed earth) of my structure as well as wall support. and metal fixings. Q (1): "My question is about floodings caused by heavy rain. Is it usual that these townships flood during the rain season? If yes, what is the usual height that the water level achieves? Is it acceptable to drain the water, using a slight inclination in the ground, off the courtyard to the exterior of the plot?" In this region homes are usually built 2 feet above the ground level to protect the house from any run-off water. Townships usually have some drainage by public grid along the major roads and streets. And yes, "it acceptable to drain the water, using a slight inclination in the ground, off the courtyard to the exterior of the plot"
Q (2): "Can we define the measures of an hand pressed brick? If not, what are the options for standard measures?" You can define the measures of an hand pressed brick to an extent. You can get a hand-press built to your specifications at Suame Magazine in Kumasi. I know of two general sizes, one is for molding large blocks of about 11 x 14 x 11 inches and the other is molding smaller bricks. Manual/Hand Brick Press. In this photo, a mixture of wet soil and cement is poured into the press. The heavy lid is lowered to compress the soil-cement mixture. The stablized mud brick is then left to set. 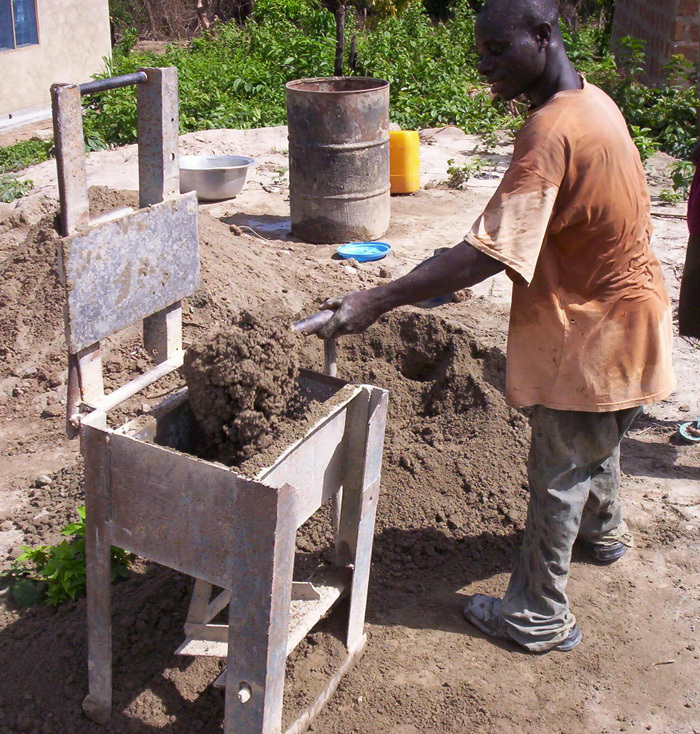 Making sand-bricks by use of a Hand Press. The mold/chamber of this hand-press has been divided into two to mold two standard sand-bricks at a time. (3): "Is it normal/necessary to have glass frames in the windows in this area?" Use of window frame made of wood and glass louvre blades made of glass or plywood are common building practices. Q (4): "Is it possible that I design my own doors and window shaders using local wood, instead of buying standard?" Q (5): "How much does a usual latrine cost (including all expenses)?" It would vary significantly according to the design. I can give an estimate based on the construction method and dimension of the toilet design. Q (6): "Is it cheaper to purchase the wood from the local forest, or to buy it from the wood market?" Q (7): "Is it possible to include mid size trees in the plot? If so, how much would it cost (a relatively grown tree)?" It is possible to include mid size trees in the plot, but planting seedlings is most common. referring to AK's question: I am looking for standard formwork prices since we are working with rammed earth too.